Accepted knowledge is dangerous if it’s not tempered by critical thinking. Jennifer Bridges, PMP, looks at that old axiom, “The customer Is always right,” and tells you why it’s flawed. Is the customer always right? Jennifer went against conventional wisdom and questioned that saying. She recalled working at her first company after graduating from college. Their mantra was, “The customer is always right and everyone is a customer.” This included everyone from the boss to suppliers, peers, vendors, her team and external customers. As you can imagine, such a situation can be confusing, dubious, difficult, or maybe even motivational—but certainly complicated. When is the Customer Wrong or Right? This isn’t a philosophical question; Jennifer explained that right and wrong aren’t always clear cut. She explored some examples, such as, “Your system is down.” Well, in this case, the customer might be right. Check and see. Then there’s the common, “My password doesn’t work.” As you know, this could be the use of an incorrect login, in which case the customer is not right. What about questions and complaints that might be right or wrong, such as, “These directions don’t make sense,” or “Your customer service is slow”? To jump to the conclusion that the customer is right is not addressing what could or could not be a real issue: there is an underlying cause that makes them submit such complaints. This cause is what needs to be addressed, rather than the blind appeasement of your customer. It’s also important to keep in mind that the customer is only a human being, with flaws that any of us can have. If you look at the customer as fallible, then it can be more obvious when they’re confused, exaggerate or outright lie. If you always believe the customer is right, then you can lead your business practices astray by trying to satisfy everyone’s demands. Figure Out What They’re Saying: To do so, Jennifer insists that you must use their complaint or suggestion to uncover what they value. For example, if they don’t understand something, they’re looking to you for clarity and simplicity. While if they say service is slow, they obviously want a quick response, even if you can’t resolve the issue immediately. Make Them Feel Right About What They Value: This means that there’s no benefit in telling them they’re wrong, even if they are. Validate their concern and show them that you take it seriously. In this sense, yes, the customer is always right, but really you’re the one who is right in how you treat them. Pro-Tip: Whether the customer is right or wrong is less important than how you treat their concerns. Couple that attitude with a customer-centric leadership approach, and you’ll maintain excellent customer service. 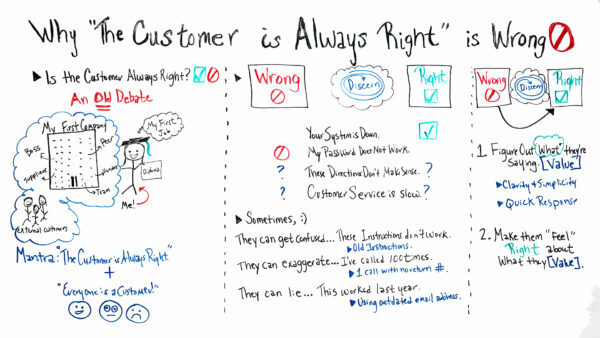 Today, we’re talking about why “The customer is always right” is wrong. Well, is the customer always right? Well, sometimes they are and sometimes they’re not. Sometimes they’re wrong. Well, before you react, this is an old debate. I’m not sure I can win. But here are some tips that can be helpful if you are in this dilemma. I remember my first job out of college and my first company. So, our mantra was, “The customer is always right.” And oh, by the way, everyone is a customer. That included my boss, my peers, vendors and suppliers, my team, and even all the external customers. So, as you can imagine, sometimes that’s joyful, sometimes it’s confusing, and sometimes it’s very difficult. So, let’s take a look at being right and wrong. So, how do we know? Well, first of all, we have to discern if they are right or wrong. So, here are some examples of some of the phrases that your customers could say. They may say, “Hey, your system is down.” Well, they could actually be right. So, it would be great to take heed, check the system, and indeed get it back up. Sometimes they may say, “My password does not work.” Well, it could be not the password, maybe they’re using an incorrect login like email address. So, it doesn’t work. But it’s not the password. Sometimes they may say, “These directions don’t make sense.” Well, I don’t know. Or they may say, “Customer service is slow.” Compared to what? We really don’t know. So, sometimes what we know about customers are, sometimes they can get confused. They can say, “These instructions don’t work.” Well. Okay. Well, they are using old instructions. Maybe they didn’t read the email address to use the new instructions after a system upgrade. They also can exaggerate. You’ve probably encountered this one, “I’ve called 100 times, and no one’s called me back.” Well, actually, we log all of the telephone calls in our ticketing system, and you’ve actually called once and you failed to leave a callback number. They can also lie. They can say, “This worked last year,” and demand that for some reason, your system is not working. Well, the truth is they’re using an outdated email address from a company that they no longer work for. So, let’s take further look at whether they’re wrong or right. So, how do we take a customer that’s actually wrong and make them right? So again, we have to discern. But there are two steps. First of all, figure out what they’re saying. If you can figure out what they’re saying, you’re actually determining what they value. So, for instance, if these directions don’t make sense, what they value is clarity, and simplicity in instructions. If they say customer service is slow, what they value is a quick response. You may not have to fix the problem, but just acknowledging them and giving them some kind of response is what they value. So, on the second step, make them feel right about what they value. So, don’t try to tell them they’re wrong about these, turn it around and make them feel right about it. And say, for instance, “You’re right.” Clarity and simplicity in instructions is very valuable. Or you could say, “You’re right. Having a quick response from Customer Service is very valuable.” That way they feel heard and they feel valued. So, if you need some additional resources for this age-old debate then sign up for our software now at ProjectManager.com.